Chasing Snow Dreams | With a zeal and passion all my own, not for fame of fortune but for the love of snowboarding and winter. My commitment, is to share it with you. 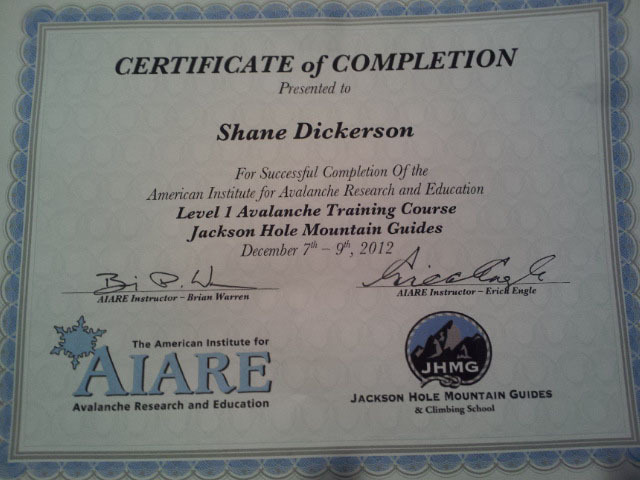 Recap on my Level 1 AIARE course… Upon arriving in Jackson I had no intent of taking an avalanche course. Once here, seeing the Teton range and the scale of the mountains and the variety of the terrain, my thought was “I had better be prepared for this environment or I’m going to get hurt.” Luckily Jackson Hole has its own set of mountain guides JHMG (Jackson Hole Mountain Guides). I had done some reading about avalanches but I really didn’t feel up to par when it came to my skill set. So naturally the first place to start is at Level 1. I signed up and upon signing up on a whim during Avalanche Awareness night at SnowKing resort. I scored a 10% discount. So $279, and the next morning I was sitting in their office. Required gear was an Avalanche Beacon, Snow Shovel, Probe, and Back Country Touring gear (i.e. splitboard) Everything outside of the touring gear you can pick up for about $300 dollars if you look around. The Touring gear can be rented. The Course followed the curriculum That AIARE (the American Institute for Avalanche Research and Education) has published in the hopes that the mountain community can standardize the way people learn and apply skills in the back country concerning avalanches. The Level 1 course was set up to include 40% time in the class room and 60% of time in the field, the course was 3 days. Day one was and introduction and really an eye opener to how much I don’t know about avalanches. We started by discussing a Decision Making Framework and reviewing a skills checklist. Dove right into the Types of Avalanches and different Characteristics of them, whether it be a point release, soft slab, wind slab and so forth. This led into layer formation, which personally I had no idea existed, my previous view of snow was that it fell pilled up and when there got to be to much it slid down hill. Needless to say this view point was very narrow. There are layers involved and they change over time due to variables such as wind and temperature, sun and rain. Also the terrain plays a huge part. All of these things are to be looked at and taken into account. In the afternoon we spent time practicing with our Avalanche Beacons. Day two started in the field. We met at a small coffee shop in Wilson, WY and Carpooled up to Philips Trail Head. From here we did a short skin up into the trees and ridge line area. Here we took a moment to dig snow pits, check layers in the snow and do a stability test. 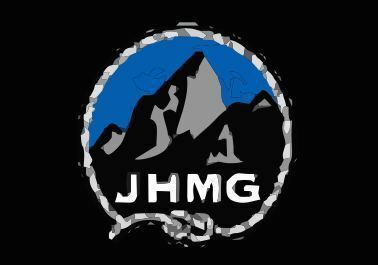 Upon returning to the JHMG office later in the day, as a group, we discussed what we found there and also compared it to the existing avalanche bulletin for the day. Communication within a group is key, both the guides (Brian and Erica), and the group worked very well together and were very open to discussion. We also discussed route planning and choosing routes, a skill all its own, relating Topo maps to what you can expect to see in the mountains and the terrain you will encounter. As a group we planned our trip for the next day. Day Three we started at Philips Trail Head, today was much more field oriented. It included a 4 mi skin up to the west ridge of Glory Bowl, during the approach we paired up to dig snow pits and to access our surroundings. 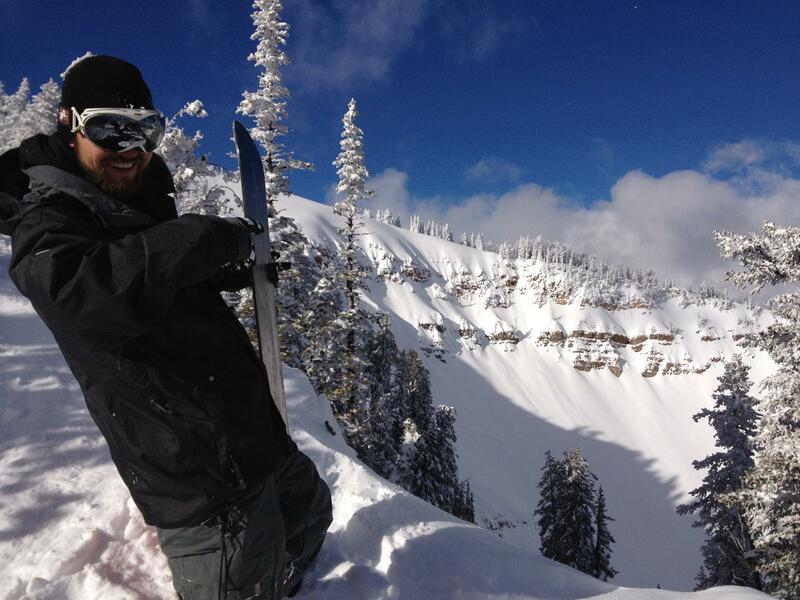 When we arrived at the ridge, the fun part came in, which was strapping my board on and taking powder runs out of there. During our decent we practice using our Avalanche Beacons again. Everything said and done we received a certificate of completion and new set of skills to take into the mountains. Overall, I learned I don’t know much about avalanches, I know I don’t want to be in them. Traveling with a partner is essential to my safety, and staying up to date on what the snow pack is doing is essential. If I am not constantly furthering my understanding of what is going on in the mountains I am putting myself in danger. Here are some helpful links to point anyone interested in the right direction. I haven’t updated here in a while but i intend on starting again. The trip i spoke of is underway. Some filming is going on and we’re really getting to the good stuff now. Headed to Jackson Hole and I’m going to get some of that “good” powder headed our way. With the next storm. Pictures and video soom! 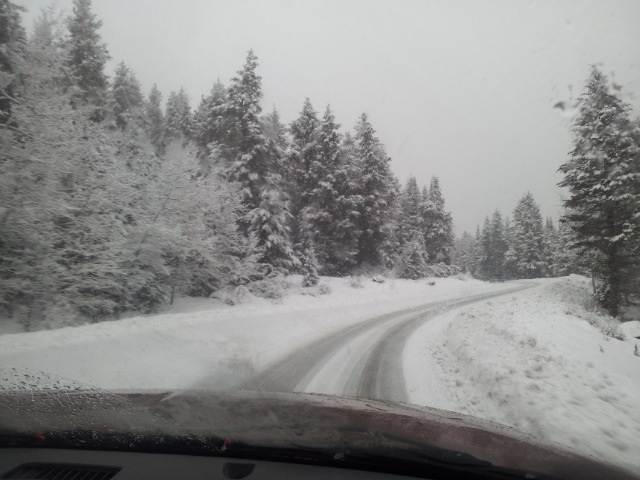 This is Teton pass just a few days ago. 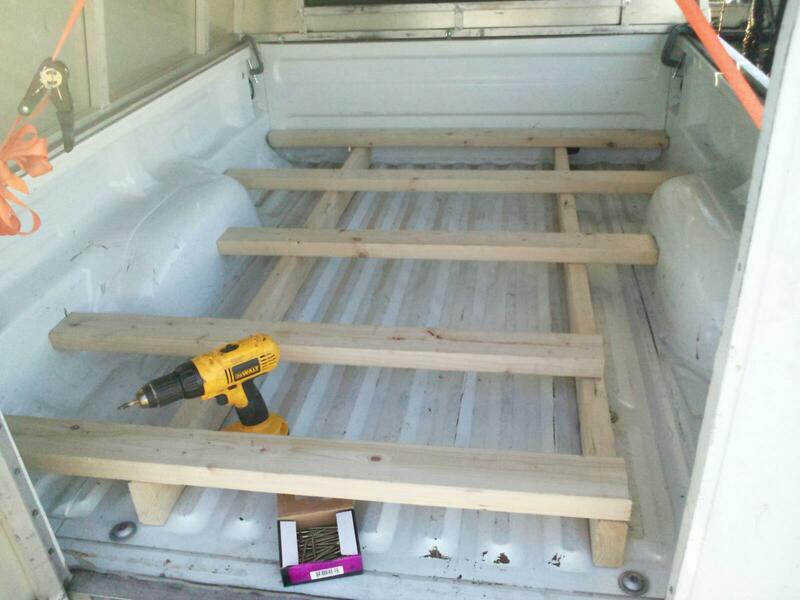 I began framing my truck bed today, I hope to have a raised platform above my truck bed to keep the cold of winter away from my body. It was funny as I was making it I was thinking of what it is to give up my apt. to save money to take on this epic adventure, really what I came too in my mind is “who cares”. If my life was based on security then I wouldn’t be taking the trip, I’d rather live through spontaneity. I’m planning on throwing a snowboard rack on the inside of the camper shell and some shelving as well. I just spent some time on couchsurfing.org, hopefully I’ll get some responses and have an opportunity to meet some awesome people on my trip. Just in case though, I’ll have a decked out truck and all my winter camping gear like a four season tent and so forth. Man, this winter road trip just got a huge addition. An unexpected one at that. I’ll be going to Revelstoke, British Columbia, CA Jan4th – Jan12th of 2013! I was reading through a post at snowboardingforum.com and just came across a post about Revelstoke Splitfest which is followed by The North Face Freeride World Tour. I’m defiantly going to attend the Splitfest and I’m looking into competition registration for the Freeride World Tour. I’ll be fresh off a month long stay in Jackson, WY and riding in the Grand Tetons, and at this point have been on the road for 7 weeks riding as many days of gnarly back country as possible. I imagine I will be up to par to at least participate in the event or sister event if room is available. I’m doing more research but I’m real stoked on the possibility. Something great will come of this. I remember sitting on the couch a couple years back, a little chubbier, real lazy, maybe even stoned, pretty much useless. I was watching videos of The North Face Freeride Tour, and I remember thinking to myself how fu**in’ cool it would be to experience that. Now years later, clean and sober, productive and in active pursuit of my dream to be the best snowboarder I can be, it may be a possibility. Even if I was only able to show up and watch, that sufficient, I want to ride but most of all I just want to be there, see and meet some other great riders. Rider licences and registration starts mid Dec. we’ll see what happens. If you’ve never heard of or seen the event here is a little glimpse. Nothing is impossible, anything can happen in your life, dream of it often, find a passion, make it an obsession and go for it. I found mine and its snowboarding. Respect, To those who came before me. I’ve got to share this. I owe a great debt of gratitude to people like Jeremy Jones and others like him. People who have followed and pursued their passions, seen the good and bad times and pushed through to the other side. One thing that keeps me stoked for winter through summer is snowboard movies! Keeps me dreaming of winter and what I work for all year. Really I owe a great deal to many people that have enabled or encouraged me in my life. My father and mother first and foremost, all the men in my boy scout troop that voulenteered their time when I was a kid, though I hated the idea of belonging to that organization, it taught me a great deal. My boss now, Keith. Man that guy is on point, always coming through on what he said. Never judging and always respectful and encouraging. My girlfriend Misty for being totally supportive for my crazy ideas, my friends for believing and to some extent living vicariously through me. And all those who don’t share my enthusiasm for the outdoors and higher knowledge, they say if there are people who don’t agree with you you must be doing something right. The passion of a single man, whenis an in determined, is almost unstoppable. 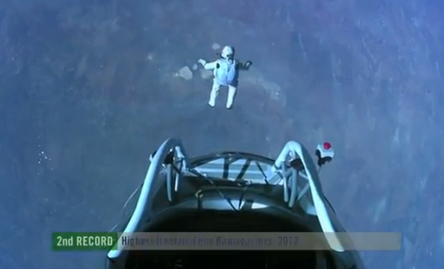 Baumgartner should be an inspiration to all those chasing their dreams.